One can argue that the human condition is experiencing one of the most confusing periods in its history. The injuries to its core are too numerous to cover in a few paragraphs. With each new injury, especially those requiring immediate government intervention, public servants have offered remedies to help citizens grow greater, including recommendations for more effective housing, transportation and everything else in between. If public administration is the landscape of government, then public servants represent the largest fleet of human assistance under the stars. Public servants take warnings and injuries seriously because we have, all too often, served as society’s first responders. This column won’t abandon the symmetry with which I’ve attempted to weave an existential narrative between public administration and public service. No, instead I’ll try to turn down the volume on a subject that should be discussed in a lower frequency — a conversation everyone should have and should do so on any device. For starters, our collective human condition has never been a continuous combination of magnolias and sunshine. If it were, there would be no need for government, order or laws. We would simply wake up each day to a newer version of utopia. Instead, we wake up each morning to what we’ve left undone and unmade from days, even decades before. As public servants, we attempt to gather our issues into neat piles of education, transportation, immigration or housing, but we never really resolve things completely. Perhaps that’s because we’re feasting on too much cellphone or perhaps not enough. A famous human once said that there is “no accounting for taste.” What one person calls art, another person calls scribbles of paint. I recently completed my first painting. I call it Clarity, of all things. 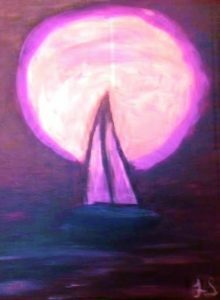 It is a blue boat on a dark rolling sea, its lavender sails outlined in black and lit up by a tortured midnight moon. I’m not under any illusions that my painting would set or break any records at Sotheby’s, but that doesn’t bother me. What bothers me is that on a canvas slightly larger than a sheet of typing paper, I chose a theme and added colors that subconsciously depicted my idea of the scattered state of the human condition. It bothers me that less than a month ago, many Americans returned home from various directions to the sad news of yet another massacre. I’m bothered that years ago and following a similar tragedy, I stood at a whiteboard in a classroom tallying the number of gun-related bills introduced in Congress against the actual number that became law. At the time, I think the result was 13 to 0. I’m bothered that it was considered too soon then and that it seems as though it is still too soon to do anything meaningful about it. We now find ourselves in the midst of yet another counting moment. One in which a rehearsed energy inhabits policy halls disguising itself as needed debate. I really want to believe there will be changes that will address the human condition this time, but I’m too post-Matrix to fall for another set of well-meaning sermonettes. I think I might have to temporarily agree with Nietzsche and admit our current human condition is a reflection of the degree to which we celebrate demoralizations as accomplishments. The current health of our collective human condition exists for a number of reasons. The least of which is a lack of duty. Whose job is it to care for us? Is public service a job or can we finally admit that it is a vocation? I don’t want to believe that we can’t trust each other. I want to believe in the notion of government as caretaker for the least of us. Public servants aren’t packaged in shrink-wrap nor are we preserved in glass jars and placed on high shelves. Our lot is compassionate, able, insightful, diligent and humane. We are the timepieces intersecting moments in history making us duty-bound to affect life changes for the people we serve. My painting revealed my fear as well as my humanity and reminded me of my duty. A lonely boat on a dark ocean is a shameful depiction of reality after everything we have been through as a people, as a society and as a nation of immigrants. Public Service is personal and requires the belief that one can make a difference. Public Service is not darkness and hopelessness, but rather, it is the light we bring to the human condition we find it in. And no matter the human condition, no matter our place or position in life, public servants inherently know that we all exist within the vapors of a distant mercy. It’s never too soon to do something meaningful. It’s too soon not to. 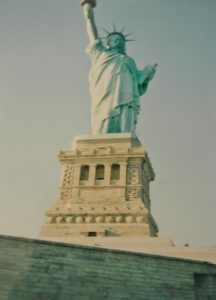 Images: All images were taken by Lisa Saye; The Statute of Liberty and Clarity (painting by Lisa Saye). I really enjoyed your column.keep the flag flying higher and higher and thank you. This piece touched my heart. You have hit the nail right on the head. it is high time that as public servants we serve the people with compassion and dedication to address the needs of the people we serve. This is my favorite”We are the timepieces intersecting moments in history making us duty-bound to affect life changes for the people we serve”. You have demonstrated again in this Article the preeminent place of the Public Service in promoting the living condition and overall welfare of the people. As Public Servant, we bring light “to human condition”. To what extent is the Public Service performing this role across the world? There is urgent need for continuous assessment. This is indeed a wakeup call! Many, many thanks, Hassan. Thanks as well for your inspirational comments! Thanks so much, Kelvin. I must say that your last sentence captures even further the essence of public service. Thanks so much, Dyanne. I grow with every comment! As others have commented on your article, it is beyond words and brings light to all public servants that provide service to our nation. I enjoyed reading the article and, of course, your artwork that always adds character to your brilliant, creative style. I feel that I grow as a person with each article you write. Dr. Saye, once again you present clarity and a new perspective on the relevance of public servants on our society. Thank you. This we can develop into a campaign to create awareness to the world of the importance of public servants. They must be appreciated, cherished, recognized, elevated and rewarded because of their selfless service. A deep and articulate article. The title can be redrafted as the philosophy of public service. I appreciate your consideration of public service, which carries a humanitarian message, beyond the fact that the public service is just a burden to make money, but that the public service is a humanitarian message. I think here the creativity lies in accessing to the human welfare. Thanks for your inspirational thought. Greetings, Deborah. Congratulations on your ASPA membership! Thanks for your kind words and sentiments and I am happy that you could find so much in my words to highlight and emphasize. Remember, as a public servant, your own words are valuable as well. My words come from a host of my own personal experiences, education and exposure from observations and capacities around the world. You also have experiences whereby you are able to derive your own narrative in serving the public. It is the collection of all of our stories and goals that help us to serve a diverse public. Thanks, Beverly. I’m glad that you enjoyed it. Mike, thanks for your compliment about the painting. I had heard before that the brush,the colors, the theme knows the heart of the painter. And that is the absolute truth. Dr. Robinson, thanks so much for your kind words. Your comments about the selfless duty of the public servant is spot on. Congratulations on this glorious work. “The Artful Duty of Public Service: Changing Lives and Intersecting Moments In History”. I concur; the column’s message is actually profound. This is a distinguished style of writing. The writing is creative and thought-provoking. For example, you said “our current human condition is a reflection of the degree to which we celebrate demoralizations as accomplishments. Furthermore, you artistically choose your words “Duty, like Art, is in the Eye of the Beholder” and your first painting which you termed “Clarity, of all things”. On social change, you said “Public servants aren’t packaged in shrink-wrap nor are we preserved in glass jars and placed on high shelves. Our lot is compassionate, able, insightful, diligent and humane. We are the timepieces intersecting moments in history making us duty-bound to affect life changes for the people we serve”. This is awesome. I also agree that Public Service is a personal decision that requires belief that one can make a difference in our society. Dr. I am exited too; it may interest you to know that I am a member of ASPA (See attachment). My confession: I am a Public Servant; therefore, I will bring light to any human condition that is darkness and hopelessness. I am also pondering on the matter of “vapors of a distant mercy” and affirming your words that “It’s never too soon to do something meaningful. It’s too soon not to”. While wishing you the best in all your endeavors, I say Kudos and thank you. Your writing, your spoken words, and now,……your drawing. You have indeed conquered the Arts. Dr. Saye, you could not have said it any better. “Public Service is not darkness and hopelessness, but rather, it is the light we bring to the human condition we find it in”. Serving people is a duty, that public servants must understand. Putting self before others is not a true public servant. However, Dr. Saye, your intellectual, innovative, and creative mind inspire us all. Great job!